In the 2000 Presidential Elections, the press reported results in real-time which, some say, may have effected the outcome since people in the western US, AL, and HI may have skipped voting, thinking it was a forgone conclusion. 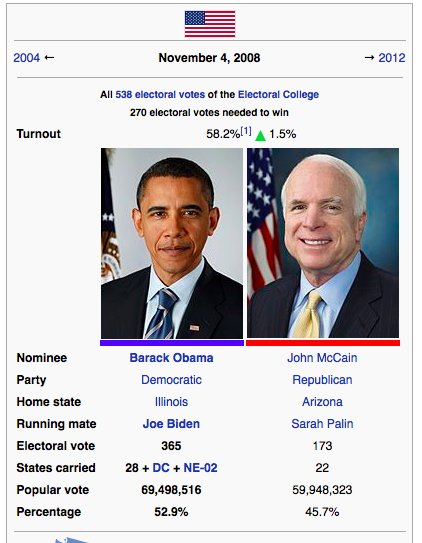 During the next major Presidential Election, in 2008, it wasn’t a close race (365 [Obama] to 173 [McCain] electoral votes), but none of the major networks called the race until 11 PM ET (8 PM PT), at the exact minute when the polls closed everywhere but Alaska. I wonder how they'll play it, tonight? Keep in mind that, while freedom of the press is critical, these news companies are for-profit businesses that need to make money. They make money by making news. By making more news, more people tune in. To make more people tune in there needs to be suspense and excitement. A close Presidential Election does exactly that. Now take a look at the news cycle leading up to today's election. Have you ever noticed that the Presidential debates are hosted by journalists? On the surface, that makes sense since they should be able to interview people without bias. Of course, they do their best – in lines with their employer's desires – to be unbiased. But there are two points where this isn't the case. The first, and most obvious, is the fact we all have slants. I've done video and written journalism and I've seen how simple it is to have a story focus on what I'm most interested in. At best, it's unintentional bias, at worst, it's misleading (which we see, every single day, in politics). One can speak the truth with the intention to deceive. Second, and this isn't obvious, is there are subtle cues in the news to make it more dramatic. A slow motion scene of a recently deceased Challenger crew; or a studio audience at a Presidential debate. Between keeping your eye on the news crawler at the bottom of the screen, along with the transition sound effects and breaking news graphics, you are forced to pay attention. Would not the debates be more effective at informing citizens if there was no clapping, cheering, or booing? Of course, the audience is told by the moderators to refrain from making any noise, but that doesn't work. What also doesn't work is telling the candidates not to interrupt each other. The latter issue could be solved by either switching off the mic of the candidate who doesn't have the floor, or giving that candidate the option of overriding the switched off mic while incurring a time penalty. Television media has a very good idea about how their reporting will affect their viewers. Repetitively showing dramatic events will keep people on edge which keeps them tuning in. One way I've serendipitously discovered to avoid the news drama is simply by not watching live TV news. But, I am not disciplined enough to do this on my own; instead, years ago, I cut my cable service to nothing but Internet.